A CENTURY AGO they were the three most popular varieties in the Northeast. Today, Baldwin, Rhode Island Greening, and Northern Spy apples are hard-to-find heirlooms. But a number of orchards still feature them, and they are definitely worth seeking out. Visit Find An Apple on our New England Apples website to find where they are grown. These three apples gradually decreased in popularity in the early 1900s. They presented certain challenges for growers. Northern Spies take longer than most varieties to begin bearing fruit. Rhode Island Greenings typically bear heavily only every other year. Baldwins went through a devastating freeze during the winter of 1934 that wiped out more than half their numbers. Meanwhile, varieties like McIntosh and Cortland rose in popularity. Yet today Baldwin, Rhode Island Greening, and Northern Spy are enjoying a modest comeback, for good reason. All three apples are excellent for cooking, especially in pies. 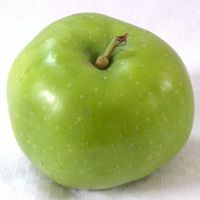 They share a New England heritage — Baldwin in Massachusetts, Northern Spy in Connecticut, the Rhode Island Greening, obviously, in Rhode Island. They each have a distinctive, sweet-tart taste that makes them excellent for fresh eating as well as cooking. Many a mother, great aunt, or grandmother considers Northern Spy the best pie apple. It’s big, for one thing — a not insignificant virtue when trying to satiate a hungry household. Northern Spies also hold their shape while cooking, a valuable quality for cooks who like to pile their pies high. Yet size and stability are not the main reasons generations of cooks have favored the Northern Spy. After all, Mom’s apple pie lingers on in memory due to its exquisite flavor, not its bulk. In his classic work, The Apples of New York (1905), S. A. Beach is positively effusive about Northern Spy. Comparing it with Baldwin and Rhode Island Greening, Beach writes that Northern Spy “is superior to either of these in flavor and quality. 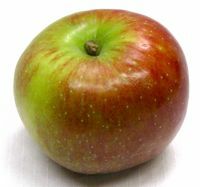 The seed that produced Northern Spy came from Salisbury, Connecticut, around 1800, on the farm of Heman Chapin. Chapin planted the seeds after moving to East Bloomfield, New York. Northern Spy was released 40 years later. Its parentage is unknown. Baldwin is even older than Northern Spy, originating in Wilmington, Massachusetts, in 1740. While its parents, too, are a mystery, Baldwin has a well-documented history. 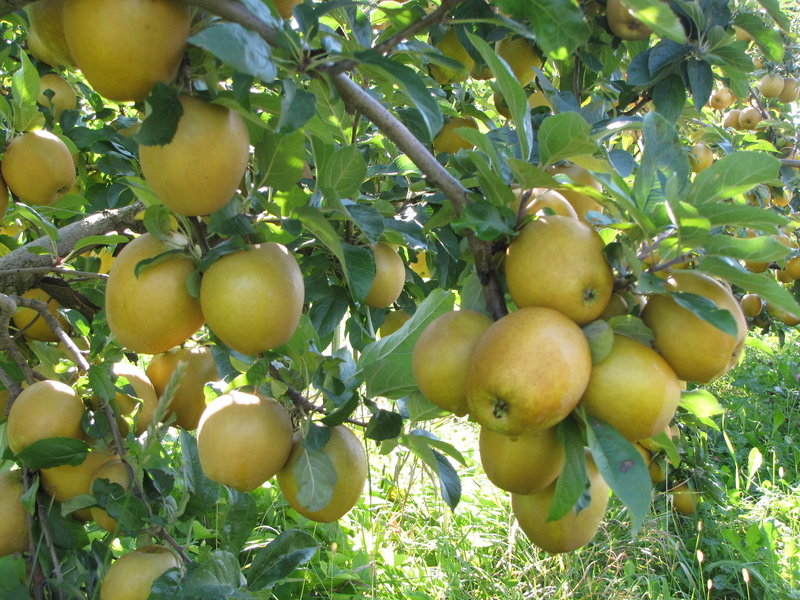 Its cultivation passed from Ball to Butters to Baldwin: John Ball, owner of the original orchard; a Mr. Butters, who later purchased the land; and finally Colonel Loammi Baldwin, who gave the apple its permanent name. Baldwins were first named Woodpeckers because the tree was popular with those birds, and then Butters, after the orchard’s one-time owner. Introduced commercially around 1784, by 1850 Baldwins were the Northeast’s most popular apple. They remained so for more than fifty years. Baldwins, too, are excellent in pies as well as for fresh eating; they are aromatic, with a spicy, sweet-tart flavor, and they hold their shape well. Rhode Island Greening has a delicately tart flavor and a tender, juicy flesh that is often a lighter green in color than its skin. HERE’S A VARIATION on apple pie from Sally Powell of North Lebanon, Maine, who got it from her mother, Beatrice Boyce, of Elm Hill Farm in Brookfield, Massachusetts, where Sally was born and raised. At age 87, she made it just the other day, using the skillet given to her on her wedding day in 1948. Cream together butter and sugar. Add egg and vanilla, and beat well. Mix dry ingredients together, and add to batter alternately with milk. Set aside. In bottom of large cast iron skillet, melt butter, cover generously with sliced apples, and sprinkle with sugar and cinnamon. Drop spoonfuls of dough on top. Leave open spaces between spoonfuls. Place skillet in oven and bake at 350° for about 50 minutes, or until apples are soft. Remove from oven, and turn over onto serving dish. My Mother’s Apple Pudding can be eaten as is, or “covered with good old Jersey cow cream,” says Sally. She should know: Elm Hill Farm was famous for more than apples, as home of Borden’s original Elsie the Cow, a good old Jersey. Note: An 8″ x 8″ baking dish can be used in place of the skillet. For variation, drizzle butterscotch or caramel sauce over the pudding. ‘TIS THE SEASON to sample apples, especially now that varieties like Baldwin, Northern Spy, and Rhode Island Greening are starting to come in. 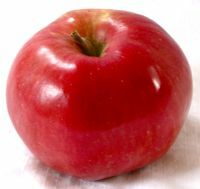 Other, more widely available late-season apples include Fuji, IdaRed, Mutsu (aka Crispin), Rome, and both Golden and Eastern Red Delicious. We know of places to sample a variety of New England apples, old and new, in three states this month. Check your local orchards for other tastings. October 15-16 and 22-23: Mount Wachusett in Princeton, Massachusetts, hosts its 28th annual Applefest, where a number of varieties provided by Red Apple Farm in Phillipston will be available for sampling. Among Applefest’s events is an apple pie contest Saturday, October 15, at 3:30 p.m.
October 22-23: An heirloom apple tasting event will be held at Alyson’s Orchard in Walpole, New Hampshire, from noon to 3 p.m.
October 22: Russell Powell and Bar Weeks of the New England Apple Association will make a presentation about the region’s apples at the White Memorial Conservation Center in Litchfield, Connecticut, at 2 p.m. Refreshments will include apple pie and cider. RICH APPLE FLAVOR tops the list, but one thing that separates the heavenly, from the merely mortal, apple pie is the quality of the crust. Making flaky piecrust is an art that takes years to perfect. It used to be that lard was considered essential for this task, but seasoned pie chefs like Marge Cook of Cook’s Farm Orchard in Brimfield, Massachusetts, and Andrea Darrow of Green Mountain Orchards in Putney, Vermont, make a superb crust using butter. The video below features Andrea’s methods for making a perfect crust (two other videos on the Recipes page of our website take the pie from assembly to baking). When it comes to pie crust, practice is as important as method. But no matter how many times it takes you to become expert at working the dough, the flavor of the filling will always satisfy your audience.